Kevin has been the president of Funny Duck Ultimate for three years. Funny Duck run free open trainings every Saturday and manage two Albert Park League teams of new and intermediate players. Kevin helps new players transition into the sport by fostering a supportive and inclusive environment. He is a committed leader and a great teacher. 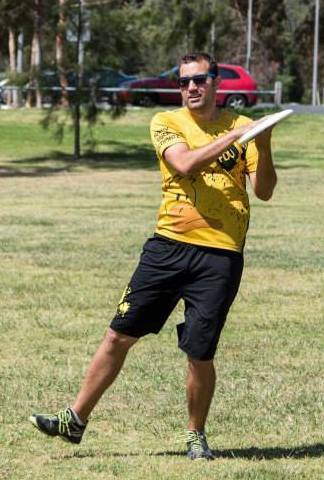 Kevin is also one of the most active organisers of social ultimate in Melbourne. He organised a free beach league through December and a mini beach tournament in January. On top of this, he champions regular beach pickup. Kevin also has a key volunteer role at the Savage Sixes and Melbourne Hat tournaments, where he handles all of the catering – a huge task. He manages all of this as a volunteer and always with an infectious smile! Thank you, Kevin, for your generous contributions to ultimate in Victoria! Do you want to nominate somebody for VOTM? Please email admin AT ultimatevictoria.com with the details, or send us a message us on Facebook!